Austin Eavesdropper: Announcing: THE AUSTIN BLEET-UP! This is the first of TWO events we are planning for Austin bloggers this year, and we are so excited! TRIO at Four Seasons was kind enough to reach out to us and offer to host this shindig, to which we said "yes please." We will have appetizers, s'mores, sparkling blogger conversation, half-off wines by the glass, and a photo booth by Cory Ryan. In addition to this blog, Austinist, Ultra8201, and AustinBloggers.org are kindly co-sponsoring. There are so many amazing blogs in this city, and as I was messaging people today I realized that I don't have email addresses for a lot of you! I have many....but not all. Not by a long shot. That's because we are likely "comment friends," the closest friendship ever forged. So go RSVP, and I can't wait to meet some of you face to face. I'm bringing my fog and karaoke machine along with my disco ball. Aaron - somehow you snuck in my brain and figured out exactly what I like. :) We haven't met yet, but I can already tell you'll be a BFF. When I saw the word "bleet-up", I thought it involved goats. While that is still unconfirmed, now it involves a fog machine and karaoke? This sounds like my kind of event. With or without goats. Just came across this. 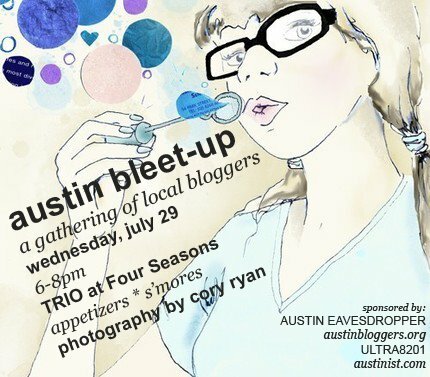 Can't wait to meet some fellow Austin bloggers! LOL - I should clarify right now that there will be no fog machine / karaoke. :) Aaron was only kidding (I think) - but I like everyone's enthusiasm, as I am a fog machine / karaoke enthusiast myself! In fact, we had one of those items at my birthday this year....and another at my wedding, haha. LOL I had a feeling that there was not going to be a fog machine. A man can hope though lol. Isn't there already a bunch of bloggers somwhere in austin?